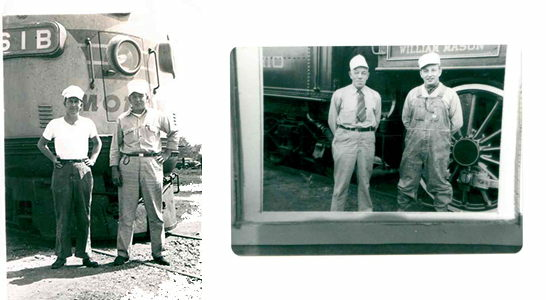 After returning home from the war, Charles (Chuck) Henriott took a position with the Monon Railroad. Working "The Hoosier Line" from Chicago to New Albany, and places in between, Chuck was employed with a company who gave travelers an opportunity to see the states in a way many never could before. A young married father who'd worked his way up to fireman, he helped man the locomotives that carried not only passengers, but also freight. One fateful day in September of 1951 changed history for the town of Monon and the Henriott family when the engineer failed to slow for a 15 mph curve in front of the Monon Depot. With a perfect on time record, the engineer, for reasons unknown, was running behind schedule after his Chicago departure. Two miles outside of Monon, the train traveled around 80 MPH; a speed too fast for the 90 degree turn ahead. The train was unable to make the turn causing it to jump the tracks and level the three story brick Monon Station. Chuck was buried under tons of bricks and debris. He would survive. The engineer was not as fortunate. After months recovering in the hospital, Chuck was released yet sustained injuries preventing him from continuing to work on the rail line. His search for ways to support his young family led him to conversations with a teacher who sold life insurance in the summer to make ends meet. Soon Chuck realized between his love of people and his knack for a good long chat, selling life insurance was something he could do. And he did. Chuck's story models the resiliency of people and what a strong work ethic will do when one is open to opportunities. So when we tell you The Henriott Group began with a train wreck, we're not kidding. Through those humble beginnings over 50 years ago, we've grown into a multiline agency with top notch consultants who care just as much for their clients' wellbeing today as Chuck did many moons ago. With a firm belief in supporting our community, Henriott is here to walk alongside you for any train wreck life might bring your way.